Bresciani has certainly witnessed a lot of history. He is the Red Sox liaison to the Cape Cod Baseball League and is in both the CCBL and Red Sox Halls of Fame. This special fund raising event is being sponsored by the Barnstable Patriot and Wells Fargo Advisors. The evening will include light hor d’oeuvres and a wine and beer cash bar as well as a silent auction and 50/50 raffle. All proceeds will benefit improvements to McKeon Park, home of the 2011 CCBL Western Division Champion Hyannis Harbor Hawks. 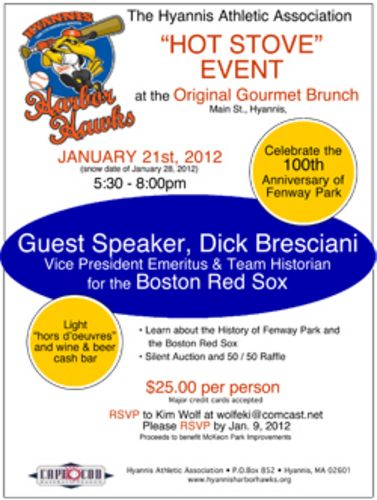 Tickets are $25.00 per person and can be reserved by emailing Kim Wolfe atwolfeki@comcast.net. Seating is limited and tickets will not be available at the door.